Michael and Tanya Trotter, The War And Treaty, performing at WMOT's 2nd Birthday Party in Franklin, Sept. 2018. The request came from soldiers reaching out to a comrade for a hit of sanity and serenity amid the firestorm of combat in Iraq. That comrade, the singer, was Michael Trotter, and that’s how he remembers the entreaties. “You just get filled with honor,” Trotter says, using the present tense to describe events from more than a decade ago. He’s lying flat on the floor to relax his back in the hours before a performance in the Fall of 2018. His mind feels its way back to a war zone in the middle 2000s. We’ve been hearing recently about the power of songwriting to rehabilitate combat veterans with post-traumatic stress disorder. In Trotter’s remarkable story, the war and the writing come from the same hyper compressed time of his life. He joined the Army in 2003 and was deployed to Iraq shortly thereafter. A captain allowed him access to a piano in one of Saddam Hussein’s bombed out palaces. And then Trotter was asked to memorialize fallen soldiers in song, something he did repeatedly, drawing on research about their lives to flesh out lyrics. This crucible of journalism and songwriting may wind up being unique in the annals of American music, and it’s had a particularly powerful impact on the duo Trotter formed years later with his wife Tanya, The War And Treaty. They in turn have had a dramatic and moving impact on Americana music over the past 12 months. In a year of tumult and tension, Michael and Tanya have embodied a lot of what’s right about Americana and what works when pure radiant love is given and received. As 2018 began, The War And Treaty were newly on the radar of an influential subset of fans and music professionals thanks to a breakthrough set at AmericanaFest. The couple was slated to be guests on a Buddy Miller showcase at the large-capacity Cannery Ballroom. When Miller fell ill, he arranged for the Trotters to take his slot and headline the show. The audience was caught off guard by the duo’s mighty soul sound and even more perhaps by their personal dynamic. Michael and Tanya exude affection for one another, even as they include the crowd in their circle of love. They blew the room away and became the buzz of the conference. To be sure, with voices and songs like the Trotters’ they were likely destined to find their way to Americana hearts and charts, but a right-time-right-place moment didn’t hurt. 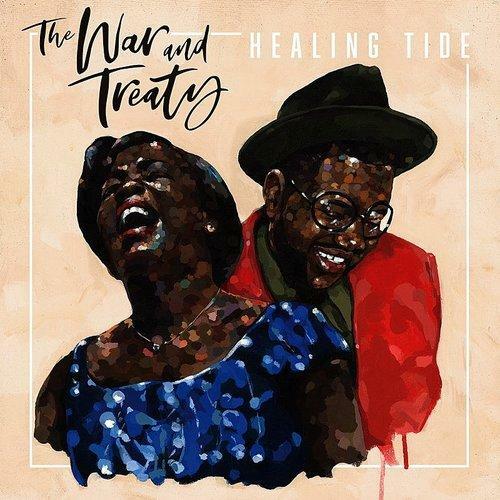 The War And Treaty launched a relentless year of touring. Billboard touted them as one of ten must-see acts on the summer festival circuit. They hit many of roots music’s prestige venues: Hardly Strictly Bluegrass, Mountain Stage and Live From Here with Chris Thile among them. And they made a triumphant return to AmericanaFest 2018, where they closed out Friday night at the Cannery and made a dozen more appearances through the week. Next up, the duo will perform Dec. 30 and 31 as part of Old Crow Medicine Show’s New Year’s Eve concerts at the Ryman Auditorium. Whatever the future holds, nothing is likely to top War And Treaty’s origin story for drama and humanity. Trotter came home from Iraq with too little post trauma care, so music, chiefly gospel, became his purpose. He met Tanya Blount, a working singer with a track record around her DC base, at a multi-bill event in Maryland. She approached him to ask if he’d written the material he’d been singing. A songwriting date sparked a romance with soul that is obvious to anyone who sees them together or hears them sing. But the performing didn’t happen right away. He wrote songs for her and himself, but then one day, three years into their marriage, a friend convinced them that they had a special vocal blend and duo dynamic. The duo will perform Dec. 30 and 31 at the Ryman Auditorium as guests of Old Crow Medicine Show. The other thing that happened around this time was even more remarkable. Michael had a traumatic episode triggered by Fourth of July fireworks. As hard as it is to believe, Michael says he had never told Tanya about his time in the military or his experiences in Iraq before that night, and when he finally did, it opened a profound new portal between them. The couple chased a variety of musical influences old and new as they found their sound, and they played a hodgepodge of gigs of varying quality. They didn’t come up through or know the Americana apparatus, but they sure recognized its spirit when they found it in 2017. The musical mix “was like growing up,” Michael says. Meanwhile, years of effort to build an authentic multi-racial coalition in and around the musical format, reflecting its roots in white country and in black blues and soul, were coming to fruition. More artists of color played showcases at AmericanaFest 2018 than applied to play in the association’s entire first decade. That is, after all, how a soldier is supposed to feel. Listen to Craig's full Q&A with The War And Treaty, taped 9.2.18. Americana is, by all indications, rocking. That applies in the metaphorical language of the street, because the community and format seem as popular as ever, but perhaps even more in the musical sense. The six days of shows I saw at AmericanaFest 2018 were, generally speaking, louder, harder and more fuzz-toned than the Americana I fell hard for decades ago.